The AskCody meeting productivity software increases meeting efficiency, improves resource utilization with detailed analytics, and makes ordering catering & AV services easier. AskCody makes collaborating with coworkers more productive and guests happier. Achieve more with AskCody for Outlook or Office 365 desktop and mobile. AskCody offers a full stack of modules for Meeting Management, Visitor Management, Office Wayfinding, and Workspace Analytics harmonizing the needs of both individual employees and entire organizations to Manage Meetings Smarter. AskCody is the most comprehensive Meeting Room Management Solution for Microsoft Office 365, Exchange and Outlook. With our Meeting Management solutions for Outlook and Office 365, you can optimize booking rooms, hot desk booking, ordering catering or other services, managing the facilities management processes, and ensure that your organization gets the most of your modern workspace. AskCody empowers users to search for, and book rooms based on availability, in-room equipment, or a number of meeting attendees. The power and freedom to book catering and services for meetings inside Outlook's familiar interface. Meeting room display software that works seamlessly with your Outlook, Office 365 and Exchange resources. A modern look and feel of your workplace, provide an instant birds-eye overview for staff and visitors. You can even report faulty in-room equipment from the tablet display. 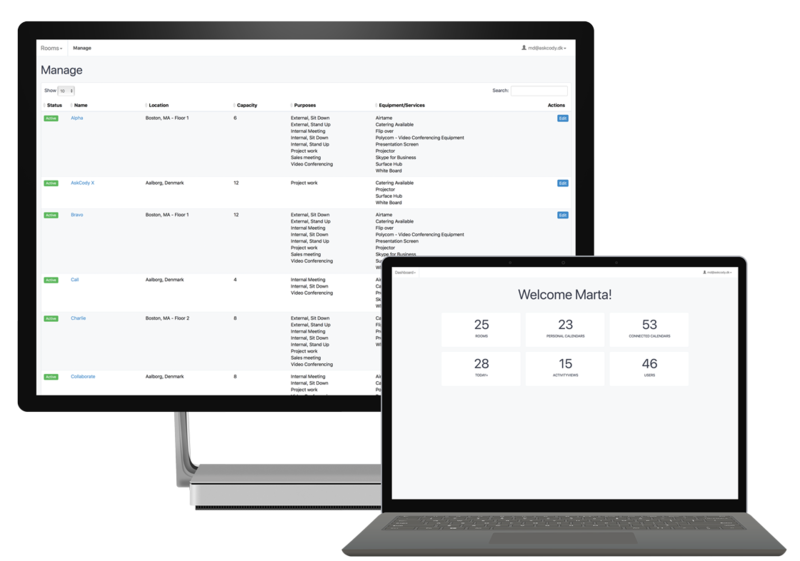 Complete GDPR compliant visitor management from guest registration on check-in screens, mobile integration (SMS/email), and office admin access for receptionists to keep track of the day's visitors. With AskCody Visitor Management you can increase front desk productivity while creating a unique and positive check-in experience. At the same time, you improve security with access to visitor history and the guest experience with automated notifications. Easy, fun, and ADA compliant interactive office wayfinding. Designed to guide people to meeting rooms, hot-desks, parking spaces, or other points of interest. WayFinder makes it easy to get from A to B. Instant know the availability of meeting rooms with the maps integration to Outlook and Office 365. You can also attach directions and the map to meeting invitations. Built-in Accessibility Mode for users of every capability. The data you need to answer questions about your meeting room and workspace performance. Go deeper with daily reporting for key metrics such as meetings, attendees, occupancy and utilization rates to optimize how your modern workspace performs. Learn which are the most popular rooms and types of meetings. Update or eliminate underutilized meeting rooms and resources. 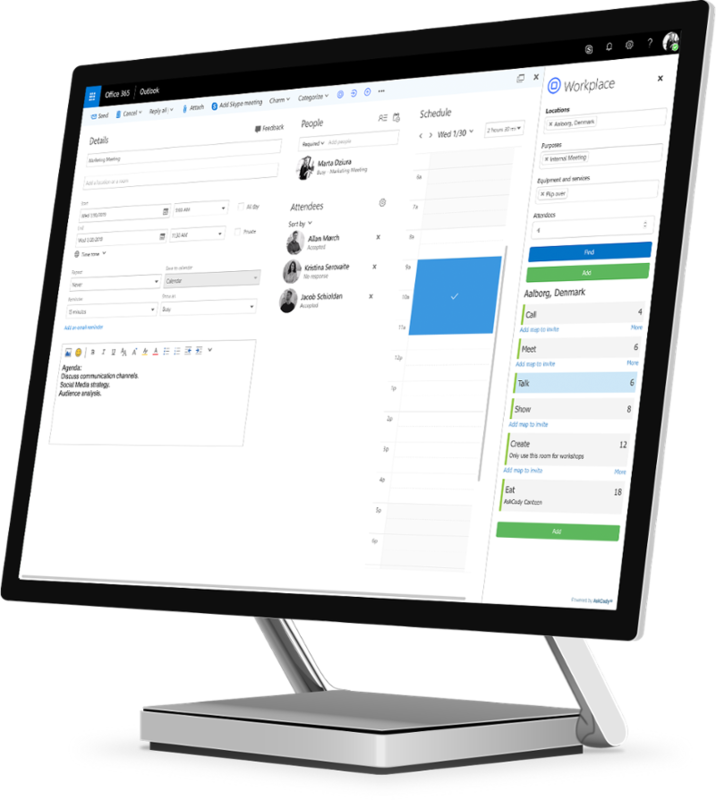 In the AskCody Management Portal in the Cloud, you can easily connect to Exchange and Office 365, connect to your calendar resources, set up all your rooms and desks, and how you’d like things to work. Your rules, your booking policies, your scheduling permissions, your room types. You manage everything in the Cloud Portal. There is nothing to install on-premise or on your Exchange Server. With Workplace Central meeting owners and meeting room managers have one central hub or place to go for everything related to meetings, events, and workplace bookings. AskCody Workplace Central gives you today's events and meetings at a glance and provides you with all the answers about meetings, guests and associated services at your fingertips. AskCody is the perfect solution for meeting management in Outlook, Office 365 and Exchange. Do you need a meeting management solution? 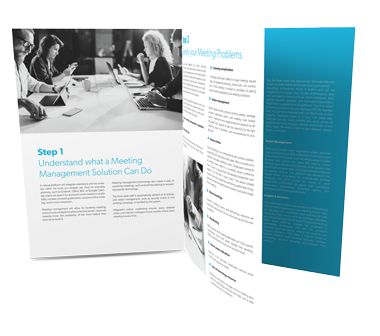 Download this eBook to learn what a meeting management solution could do for your organization. "Innovative solutions like AskCody will help our joint customers dynamically find the right space with the right equipment at the right time much more efficiently than ever before." You should see for yourself how AskCody can save you a ton on meeting management.